Commercial Plumbers Wanted – 1 or more years of commercial plumbing and/or service plumbing experience desired. City of Phoenix Journeyman License and leadership experience a plus. Trade tools and reliable transportation required. Pre-employment drug screening required. Projects valley wide. Please apply at our office located at 4723 E. Ingram St. Suite 101 Mesa, AZ 85205 between 8am – 4pm Monday-Friday. 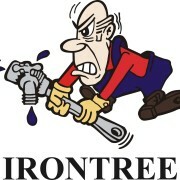 Applications are also available at http://irontree.net/careers/ to print and bring in. Please come by the office so we can meet you.